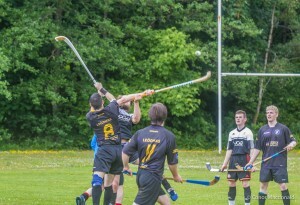 We thought we might bring you some pics and some info from the HebCelt Cup. It was tremendous occasion with Inverness’ Dougie Rankin refereeing and Uist fielding a strong all-Uist team. Uist started very strongly and made us look like the team who only play together once a year. They even had a chance to take an early lead when Gaga fouled in the box, but Keith Trumisgarry Macdonald fluffed the shot and Duncan rubbed it in with a tremendous goal minutes later. Uist had another penalty for standing on the ball but again the result was the same and Connor Chalmers’ first goal for the club made it 2-0 just before half-time. The whole Fichead Bliadhna festival was blessed with good weather and even although it started to drizzle heavily around the hour mark, the Leòdhasach play improved and we took on a semblance of a league side. However, Keith and Neil John Campbell were in great form in the middle, but wing play saw us go close a few times. The match closed out 2-0. It had been an entertaining game for the very many spectators who turned up and it was played in a great spirit, a return to the HebCelt days of old. We look forward to continuing to build links with our friends from the Southern Isles in the coming months. The trophy was presented to winning captain Will Church by Dòmhnall and Tearlach Barden. These fine young men were apt individuals to present this cup as it was their late father Alasdair who helped bring the sport back to Lewis and Harris in 1995. Their mother Donna was also in attendance and expressed her delight at the progress the sport has made in twenty years. Thanks to Dougie Rankin for refereeing and as always, the match would not have happened without the hardwork of several individuals within the club, as well as the support of the Hebridean Celtic Festival and Caroline MacLennan and her team. The platform they have allowed shinty over the last 8 years has contributed massively to its growth and we thank them from the bottom of our hearts. Congratulations to them on their own 20th anniversary and we look forward to many years of successful partnership to come. Plenty of news from the Fichead Bliadhna week to come – so we’ll put it all up in little doses! First up we’ll deal with the Craig Morrison Stornoway Sixes. These were run midweek for the first time as an experiment, and the experiment can surely be judged a success, with the biggest turnout since the first competition in 2010 and a great atmosphere around the park. The competition started on the dot at 6.30pm, with players divided into 5 teams (Blones, Bibless Babez, Tina Turners, Gaga’s Heroes and Callum Camanachd) in a league section, 10 minutes one way, 3pts for a win, 2 for a draw and 1 for a loss. The Bibless Babez powered through the league section without conceding a goal – young Ruairidh Macmillan was on absolute fire – melting into Gaga at one point and leaving him raging! The Blones team battled away and performed credibly for the most part, although they failed to score, although Poppy and Nicole playing for other teams kept up the female end well. However, the Tina Turners would sucker punch the Bibless Babez with another masterclass from Peter Goalmez – his years of watching Italian football helping him usher his team after a shaky start to eventual final glory. It was also another excuse to see his iconic celebration. It was great to see big Sean McCarthy out swinging a stick and our young and young at heart guests from Edinburgh and Glasgow did themselves proud. Kenny “Scalpay” Campbell was on the winning side, the MacDiarmaid brothers displayed some great touches for the Heroes and David Murray won young player of the tournament, whilst his brother Callum was an important member of his eponymous team. Ruairidh MacMillan was a deserved Player of the Tournament and both he and David Murray received their prizes from Iain Sinclair. Thanks to Annette Murray for the use of Stornoway Primary. The shield as always was presented by Craig’s parents, Graham and Kareen, and other members of the family were also present. Graham presented the trophy to winning captain Peter Gomez.